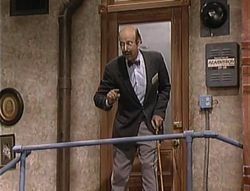 First appearance "A Basement Divided"
Doc Freud is a family psychotherapist from Brooklyn appearing in the live-action The Super Mario Bros. Super Show! segment "A Basement Divided". He speaks in a German accent, and describes himself as being very famous, yet very affordable. He also has a flat rate that he charges for all families regardless of how many members they have. Doc Freud also walks with a cane, indicating that has some sort of physical handicap. During his childhood, he supposedly had a bad experience with black duct tape. Doc Freud is named after famed psychoanalyst Sigmund Freud. When Luigi sections off half of Mario Brothers Plumbing as an area for Mario, whose sloppiness has gotten out of control, Mario calls in Doc Freud to help settle the situation. Sitting down on a chair on the center of the line, Doc Freud asks Mario and Luigi how long they have been harboring their feelings of resentment and sibling rivalry. Mario does not understand what Doc Freud meant, so Doc Freud simply asks how long they've hated each other's guts. After Luigi answers that they have hated each other since birth, Doc Freud asks if they had any traumatic experiences as children, and freakw out when he suddenly spots the black tape that Luigi used to divide the basement in half. Mario tells Doc Freud that he does not think so, bringing him to the conclusion that Mario is simply a big slob, and scolds him for being one. Doc Freud insists that the line should remain where it is until Mario manages to clean up his act. He then bids Mario and Luigi farewell as he leaves the basement, leaving the two brothers in their still-divided home. However, Mario eventually realizes that he needs to start cleaning up to earn Luigi's respect, and promises to do so. This page was last edited on February 7, 2019, at 01:08.